A Lagos State Traffic Management Authority (LASTMA) official, Hammed Balogun, was yesterday killed by a female IBTC Bank employee identified as, Yinka Johnson, while driving against traffic in Ajah. The traffic management official was reported to have accosted the woman for contravening the state traffic law when she ran him over and zoomed off. 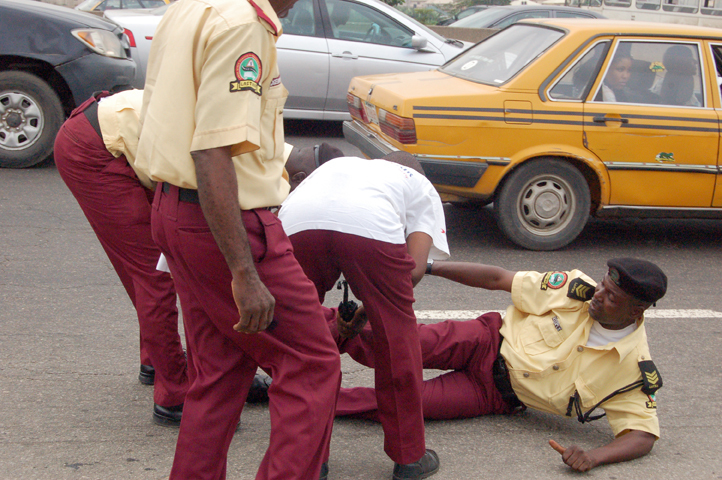 The LASTMA general manager, Mr. Babatunde Edu, who confirmed the incident, said, after crushing the 33-year-old traffic official to death, the banker, driving a green Landrover four-wheel-drive with registration number, CY 276 LSD, drove into Ikota Estate where she was protected from arrest by the estate security. According to the Punch Newspapers, Edu said, “Balogun was this morning (Friday) killed by a banker on the Lekki-Ajah Expressway while carrying out his official assignment at his duty post at Mega City, Ajah. “The driver, whose identity was revealed by the auto inspector device as Yinka Johnson, an employee of IBTC, drove in a green LandRover Jeep with registration number CY 276 LSD against traffic from Mega Chicken inward toll plaza two. “She was intercepted by three officials of LASTMA led by the head of Operations, Mr. Quayum Asafa, for traffic violation. Johnson started driving recklessly in order to escape and in the process ran over the officer. “The deceased was rushed to Germaine Hospital where he later died as a result of injury sustained from the accident. The corpse was deposited at the Lagos State Teaching Hospital, Ikeja for autopsy. “Realising what she had done, she ran and escaped from the scene of the incident into Ikota Estate, Ajah with the security men shutting the gate. The Lagos State governor, Babatunde Fashola, recently signed into law a traffic bill which seeks to outlaw driving against traffic and other related traffic offenses committed daily by road users in the metropolis. This is absolutely wrong! U pple obviously reported one side of d story without proper investigation. Eye witness from the scene testified that a danfo driver hit him and not d woman. Not jst one or two witnesses! Pls always get ur facts right! Sooo sad the lasma officials should concentrait more on controling traffic and stop jumping infront of vehicles to commence arest, some drivers are leaners they should allow the police atache to them do the arest. Wow!! What a pity!! people become despirate in a bid to escape 3yrs in jail and end up killing! I think more worse things will happen! Traffic laws are broken everyday every where in the world! May God help lastma officials! Soffry soffry Nigeria. Don't let the stress get to you. Respect life. Enjoy life. This is a tragic story sha. According to eye witness,she wasn't the one that hit the lastma official,I think proper investigation should be carried out first..
How is this manslaughter? It is outright murder. The official wasn't armed and she clearly saw him. Let the law take its cause,nobodyshould be above the law.